We are repeating the IAPS School Day! 10 November is an occasion for you to spread interest in physics and this year’s theme is Environment and Energy. Around the world, members like you will organise activities at schools, universities, and other venues in order to ensure that we will have a new generation of physics students. For inspiration, this is what it looked like last year. To help you in this endavour, we have decided to make a dedicated School Day Grant. Each member committee can receive up to 500 € with a total of 1500 € given out by IAPS. The deadline is 19 October. So do you have an idea for a fun experiment in a local school? Then join us! AGM 2016 final agenda is here! At Microsoft Innovation Center (Skyparks Bussiness Center), Malta International Airport Luqa, Malta. It is recommended that all interested parties go together, so we will meet in front of university (quadrangle) at 13:00. For those unable to physically attend, stream will be available. In the last week of April almost 50 students met in Geneva, Switzerland to visit CERN. The annual excursion organised by the IAPS EC always reached a high number of interested physics students from all over the world. This year highly motivated people from 15 different countries spent two days at the CERN facilities. Apart from listening to a lecture and building their own cloud chamber, they also walked underground at the CMS detector site. If you are interested in the excursion for next year, note it down now. The registration will be open again in December. For now, you can find photos of the event here. It is now possible to register for The International Conference of Physics Students which is the main event of IAPS. This year, it will take place 11-17 August in Malta and will offer a wide variety of lectures, excursions, and social activities with fellow physics students from all across the world. So far 140 have already registered and acceptances and rejections are expected to be send already on Monday 8 February so be sure to sign up during this week. Note that you can get you registration fee of 190 € plus an excursion refunded by participating in the jIAPS Article Contest until 31 March. 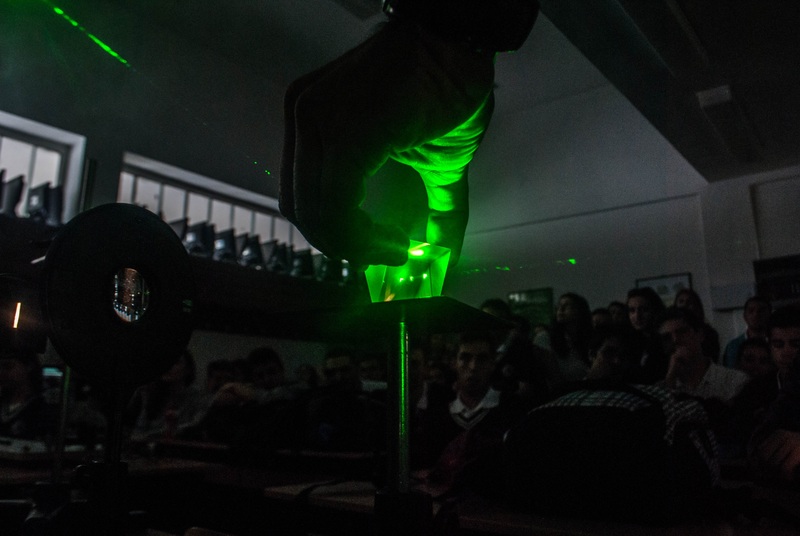 A group of motivated physics students joined together just before Christmas in order to spend some days in the beautiful area of Tuscany, Italy and learn more about light-related research and technologies. The organisers from AISF did an amazing job in the creation of this new event! At the opening ceremony, a set of LIGHTalks gave an introduction into medical applications, quantum sensors, the research done at the University of Pisa and much more. We later visited the European Laboratory for Nonlinear Spectroscopy (LENS) near Florence, where researchers described to us their work on photonics, atomic and biophysics. On Saturday afternoon, we spent some hours at the University of Pisa Physics Department and then at The European Gravitational Observatory EGO-VIRGO. This enormous facility, with arms of a Michelson interferometer extending for several kilometers, aims at proving the existence of gravitational waves through the use of advanced laser technology. On Sunday, we spent a fantastic day in Florence, which is undoubtedly a unique and wonderful city! We concluded the event with visits of the NEST and TeCIP institutes of the Scuola Normale and Scuola Sant’Anna of Pisa, where we were inspired by great work on nanotechnology and integrated photonics. The event offered many possibilities to get in contact with researchers at the individual institutes as well as with students from around the world. With participants coming from 14 countries, the event was a true international one. Many thanks to the organisers! Join iaps in its yearly trip to CERN. Check out the webpage for the registration form. Take a look at our activities page! You can find information on the yearly iaps2CERN trip here. It will take place from April 25th to 28th 2016 and the registration will start on December 8th. Feel free to contact sabrina.gronow@iaps.info if you have questions regarding the program. We are happy to announce that PLANCKS 2016 will be held in Bucharest, Romania, between 20 – 23 of May 2016! Registration will be open from 16th November 2015 until 7th February 2016. Please check plancks.org for more information. Very important, we kindly ask you to contact us until 15th November 2015 if your country plans to organize preliminaries! If you have any questions regarding PLANCKS, don’t hesitate to write to OC2016@plancks.org or plancks2016@gmail.com . We cannot wait to meet all of you at PLANCKS 2016! The IYL School Day is coming up. On 10. November students all over the world will learn more about light and light based technologies. Please motivate your members to participate. A template on how to contact schools can be found in the IAPS owncloud. Help from IAPS is also available: To enable more events IAPS has issued a call for proposals to support events regarding the IYL School Day. The grant proposal can be found on the IAPS IYL School Day webpage. Also, please feel free to contact us (iyl (at) iaps dot info) at any time, if you have any questions regarding the IYL School Day or grant.